The United States Postal Service (USPS) is our exlcusive shipping provider. CoinHappy.com ships to all 50 States. We can acquire any coin on your Want-List. Please contact our Sr. Numismatist, Dale Lee for Sets/Collections. Many collectors and dealers order these from us time and time again, because these are unsearched for rare varieties, mint errors, scarce re-punched mint marks, etc. Plus, most of these coins are 100 years and older, with many dating in the 1800s. Probably less than 5 percent wheat cents in these, and based on our 100% positive feedback, probably even those are usually better dates and/or varieties. One eBay winner found a 1917 Double Die cent, while another found a 1944-D/S. No memorial cent or post 1964 coins in these as we simply don't deal in mass-produced later date material. Grades will range from fair to as high as nearly perfect, Gem Uncirculated, MS 67 or better. At these low prices, many will probably grade average circulated to above average circulated, and many will grade Very Good to Extremely Fine. Of course, we can't guarantee specific dates and grades, but we can guarantee these are unsearched for varieties and will be a lot of fun. Each bag will include lots of old Liberty silver half dollars, quarters and dimes along with early 1800s coins, Liberty nickels in the 1800s, a few better date type coins in the early 1900s, such as Buffalo Nickels, Mercury Dimes, Standing Quarters and Walking Halves, older Seated Liberty Coins, mostly from the 1840s to 1880s, large cents, two cent pieces and/or three cent pieces, early and scarce date Lincoln Cents, Indian cents in the 1800s, along with an occasional interesting or unattributed oddity, error coin, or antique token or medal. 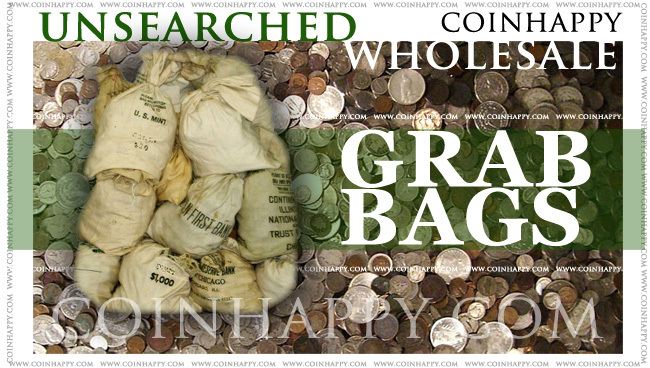 Larger bags of 400 or more will even include more valuable coins such as half cents and/or bust coins of the 1796 to 1838 period, or even a coin or two from colonial coins or tokens from the 1700s. In short, we save time and money by not listing these and can pass the savings to others by increasing sales and turnover. We buy only what we think is worth buying, so each bag will have up to double the value in our regular prices at our web page, www.CoinHappy.com . Just to make sure these are one of the best deals, we will throw in at least one silver dollar at least 85 to 135 years old for every 200 coins purchased. That brings your cost down to just a few pennies each for all the other neat and valuable coins included. No two grab bags are exactly the same, so the more you order, the more different coins you get. All of our auction items are shipped within 3 business days and fully insured. A Security International, Inc. company.All rights reserved. No portion of this website may be reproduced without prior written consent.